Which TESOL Certification is Right for Thailand? OnTESOL has the right TESOL certification for your teaching experience in Thailand. Our different courses will match your experience and career goals, so that you can pursue a happy and successful gap-year in Thailand or even pursue an international career in Teaching English to Speakers of Other Languages (TESOL). The minimum requirement for teaching English in Thai public schools is a 120-hour TESOL Certificate; however, aiming for the minimum requirements is not the best option in terms of job opportunities and job satisfaction. The 140-hour TESOL course with TEYL specialization is highly recommended for Thai public schools because you will get 20 extra hours of training with a special focus on the approaches that you should use when teaching English to children and teenagers. Get ready to stand in front of 40 rowdy kids with an accredited TESOL certification course! The 120-hour Advanced TESOL certificate is recommended for family-owned schools and Thai chains. This advanced TESOL certification program is academically equivalent to CELTA. If you want to stay in Thailand for more than one year, we recommend adding the 20-hour Teaching Business English Course (TBEC) certification. This course will prepare you for the more lucrative market of teaching English to business professionals. You can teach Business English at a language school or offer private one-to-one lessons. Teaching experience is required. The 250-hour TESOL Diploma is an advanced TESOL certification course that will prepare you for a career as a professional ESL teacher and beyond. This program is perfect for those who seek career advancement opportunities as a Director of Studies, curriculum developer, or admission to a reputable Master’s degree program. Many new teachers start their careers in Thailand to gain valuable teaching experience and then seek more lucrative jobs in countries like Hong Kong, the United Arab Emirates, Australia or Canada. Our TESOL Diploma graduates have pursued successful careers all over the world thanks to the comprehensive training that they received with us. This program is more comprehensive than CELTA or any 4-week TESOL / TEFL certification course, and it is recognized by TESL Canada at their Professional Standard 2 certification level upon completion of a separate 20-hour Practicum. Teach English in Thailand after completing your TESOL certification with OnTESOL! 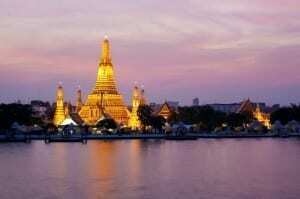 This video shows the top traveling destinations in Thailand.